A 100% full competition pack for Derbi Euro 3 engine! Special race with 44.90 ultra strengthened vilo designed to be mounted without balancer, 90mm rod, 80cc kit Ø47,6mm 6 transfers with big exhaust booster, studs, cylinder head high compression pad with volume increased room. In short, a real concentrated performance! 266,62 € 266.62 tax incl. Not approved on road open only for competition on the track, runs, road closed. Competition has only to behave themselves and is far behind the most-hand maxi kits. Only downside of this pack, the absence of a clear set clutch, bearings Celerons and several joints of base plate as the pack for AM6! 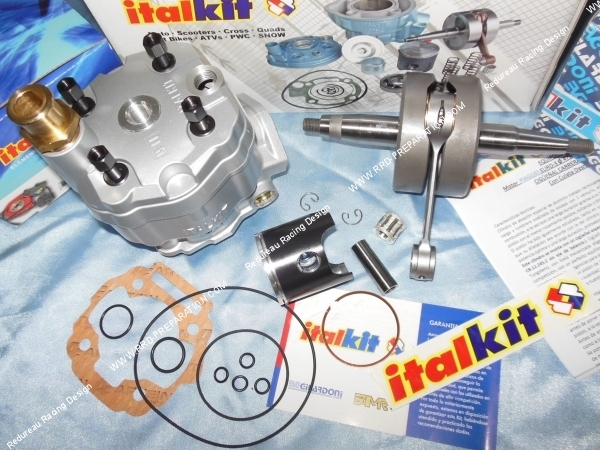 A novelty of the great Spanish brand ITALKIT and finally available to us, this ultra complete 80cc engine pack mounts on mécaboite driving DERBI euro 3. This set will give you all the power sought to distinguish when you compete and win first place. 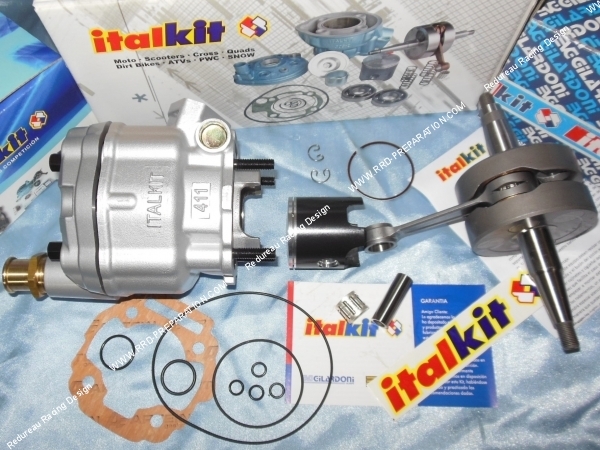 As usual, the ITALKIT brand is no exception to the rule in the pack of current best parts on the market. The aluminum alloy cylinder has a specific heat treatment and internal coating niquel / silica and external chrome, delivering it its strength and reliability, foolproof! Featuring no less than 9 lights including 6 transfers of admission, 2 boosters worked to shape and finally the impressive exhaust outlet by its shape and size to the point that the outlet diameter has been revised upward and measure no less than Ø30mm between axis fixation for exhaust 46 mm. 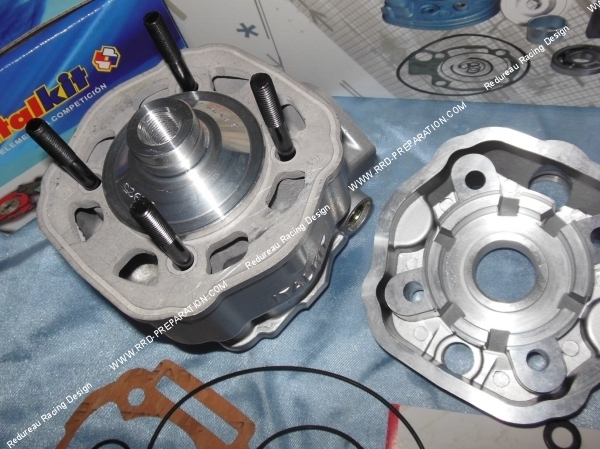 A work of crankcases recommended to align cylinder / sump to perfection. That's not all, Cooling also been completely revised and corrected in order to provide the best possible heat exchange and at the same time to get a performance gain consequently indeed less engine runs out of steam and heat and performance remain present. to accompany this cylinder, a racing stud bolt! Top model, specially designed to provide maximum compression. 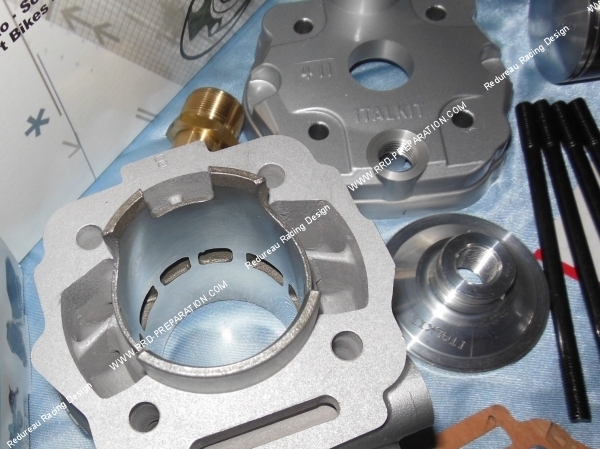 The breech block is unfortunately not used and mounted O-ring, the combustion chamber is hemispherical in shape and has a very successful polished, smooth and clean. Volume chamber revised upwards. The Ø47,6mm piston meanwhile is not chosen at random, it is a single segment in ITALKIT model with graphite treatment. Suffice to say the material of the highest quality whose reputation / quality is second to none. 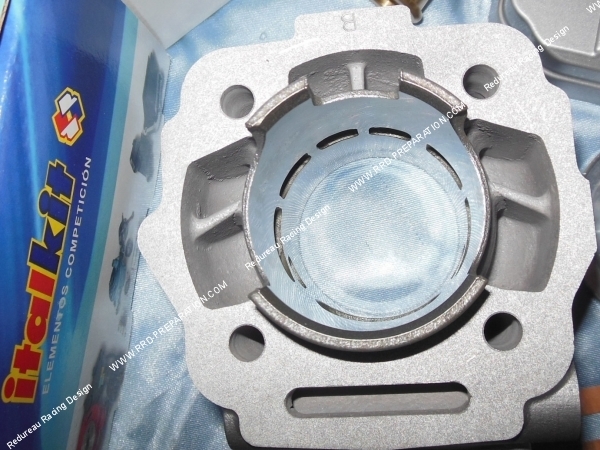 The piston is equipped with a chrome end segment thickness 0.80 mm thus promoting revving. 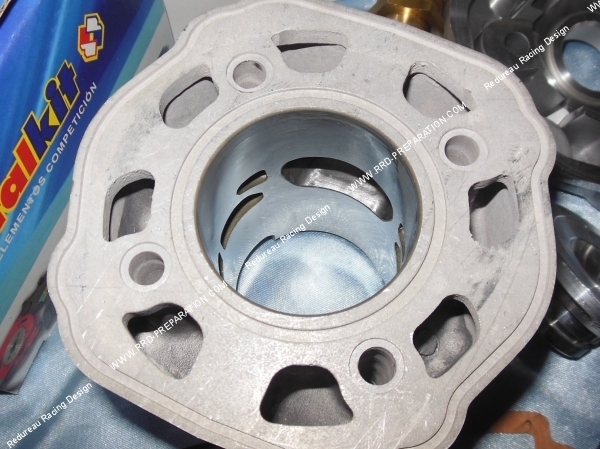 With the graphite processing, forms and composition, this piston was very well designed and studied in order to offer a better thermal expansion, agreeing at the same time perfectly with this cylinder to support the free times, brutal change Diet and prolonged endurance of circuit. 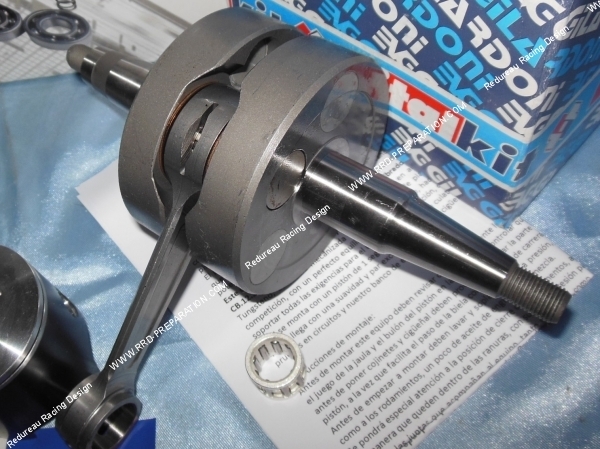 In the end, the special crankshaft and connecting rod race 44,90mm 90mm. This model is unique and once again very successful. It is perfectly balanced and carved out the best steel market. 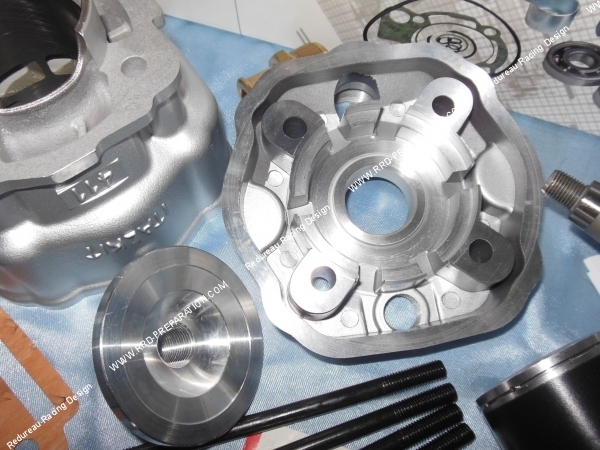 Its dynamic balancing result of the inorganic compound to tungsten carbide. This material is summarized in a combination of carbon and tungsten. It is a known material very dense, very strong and very hard. A new connecting rod is also installed on this linkage, ultra reinforced billet model. Ultra lightweight, it is really reserved for the competition! This crankshaft is not intended to be assembled with a balancer. 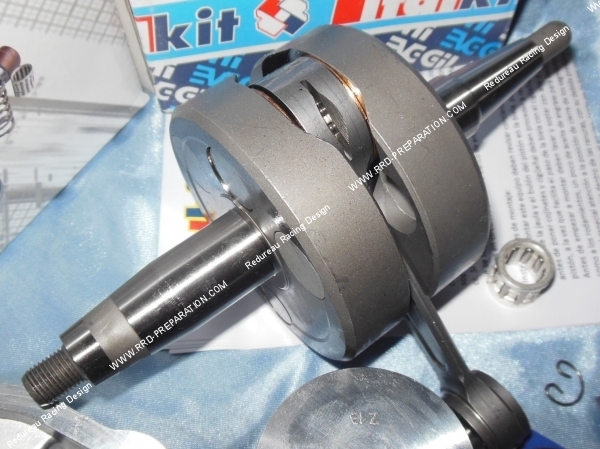 It is this type of rod that team real racing crankshafts BIDALOT or MALOSSI MHR BIG BORE and other rare vilo! Light weight and maximum rigidity are at the rendezvous. Its lubrication are improved, the cage rod feet is increased for a better grip, processed silver and mounted on anti-friction wedges. A linkage of you understand perfectly designed and adapted to support this high engine can withstand without no problem wildest engine speeds up to 16,000 rev / min and in combination with the cylinder 44.90 mm ​​and the actual engine run is 79,86cc with no less than 25hp announced by the brand provided a perfect fitting and adjustments in the rules of art! 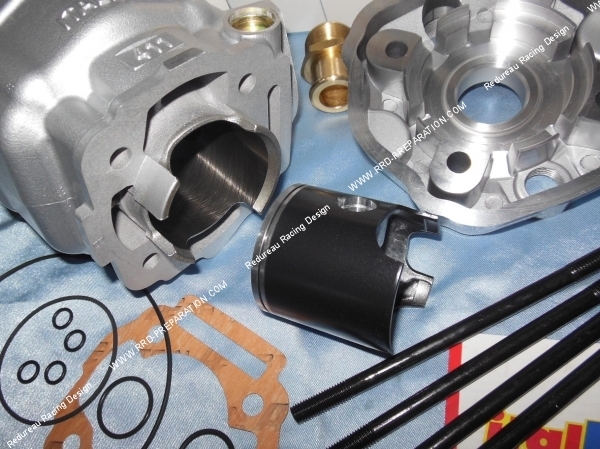 In summary, this pack / kit 80cc racing Ø47,6mm for your DERBI Euro 3 engine will be a real asset to give you victories insured competition runs ... and thrills at the same time! Delivered complete as presented, you can rely on photographs, they are binding as we usually do. 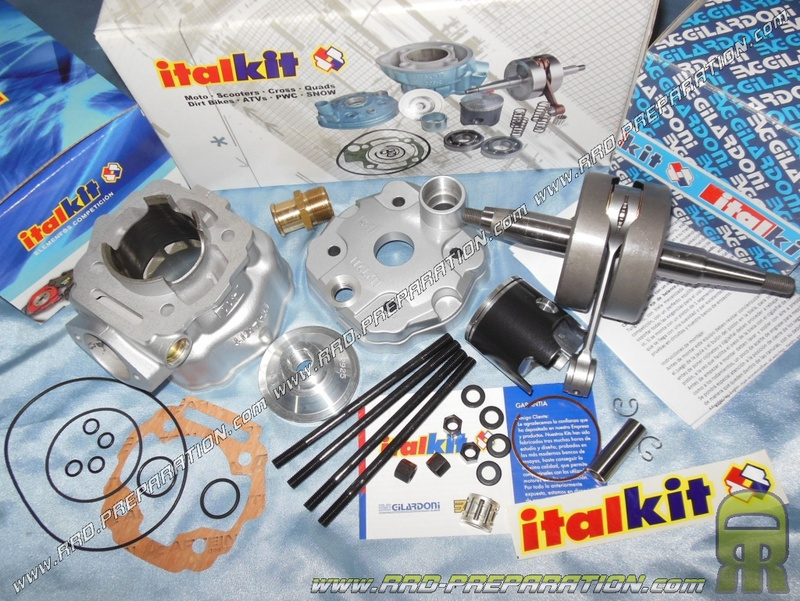 We recommend you to accompany this pack with minimum: a carburetor 26 to 28 mm for the better, a flexible mounting kit intake, ignition Selettra home ITALKIT with variable advance, cold NGK B105EGV, compulsory motor racing oil , relaxing racing exhaust large volumes necessary ... follow the assembly instructions supplied with ITALKIT. Optional we offer a preparation course 1, this preparation is a modification of the channels and the exhaust port by increasing the charts and improvement of the duct, it increases the cylinder performance. Improved piston and bottom skirt is also included in the amendment. Allow a little extra time for this preparation!